Since implementation of TSA in the USA there have been weird news about maltreatment and strange encounters. While a 85 years old woman recently alleged the TSA staff to have strip-searched her, the latest is that Vanessa Gibbs, a 17-years old teen was detained at Florida airport by the TSA on account of a pistol embossed on her purse. 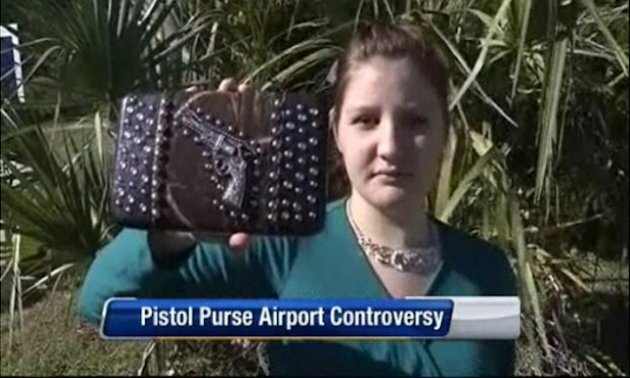 Vanessa Gibbs holds her infamous "purse gun"
The TSA says the design could be considered a "replica weapon," something that the agency has banned since 2002. Just imagine what would have happened if Gibbs had also been wearing stiletto heels, asks Yahoo News.